Your plumbing makes up the core of your home. It transports water, an essential resource, and also makes sure that waste makes its way out of your home. However, plumbing systems do not keep themselves healthy and issue-free: homeowners like you do. For this reason, we have compiled a list of plumbing tips that can help you save oodles of money and time. They’re simpler than you think. Enjoy! 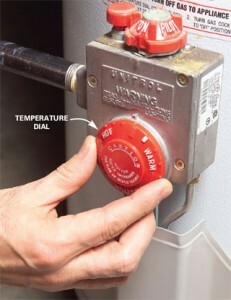 Turn down the temperature on your water heater to save 4% of your energy cost per each 10 degrees that you lower the thermostat. Even better, be sure to use the “vacation setting,” if you have one, on your water heater to keep from heating water unnecessarily during your absence. Often, the drain hose from your washing machine can dislodge from the drainage pipe, causing a massive flood almost immediately. Want to avoid this scenario? Your Washing Machine Flood Detector Auto Shutoff will sound an alarm automatically when even a small amount of water hits the floor and will turn off the washing machine to prevent further, damaging leaks. If your current model is not equipped with an Auto Shutoff, consider investing in a new model. Our experts at Simpson Plumbing can recommend great washing machines and help you install them as well! How much water does your household flush down the toilet each day? Too much! You lose gallons of water every time you press that small lever, so consider replacing your current toilet with a new, low-consumption model. Doing so could mean big financial savings in your home-owning future. Consumer favorites include the WaterSense-certified Gerber Avalanche HET 1.28gpf. Saving money where you can is a smart move for all homeowners and helps you put those funds into family vacations, retirement funds, and all the other aspects of your life that bring enjoyment and stability. Looking for more tips/? Give us a call! We’re always ready to listen to your concerns and share our expertise!